Actor George Calil will not face charges over the death of his girlfriend, Holby City star Laura Sadler, police have said. The 22-year-old actress died last week after falling 40 feet from the balcony of Mr Calil's flat in Holland Park, west London. Mr Calil, 30, who played her on-screen boyfriend in the BBC drama, was arrested after the incident and later released on bail. On Thursday, a Scotland Yard statement said he had been formally released without charge. The statement added: "Inquires into the incident have now concluded and the death is being regarded as non-suspicious." Ms Sadler, 22, from High Wycombe, suffered severe head injuries in the fall. She was taken to Charing Cross Hospital but was pronounced dead on Thursday 19 June after her life support machine was switched off. West London coroner Alison Thompson opened an inquest on Monday and adjourned it for a later date. 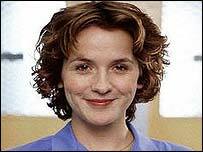 Ms Sadler, who played staff nurse Sandy Harper, had appeared in the BBC One drama for three years. The tributes were led by Lorraine Heggessy, controller of BBC One, who described Sadler as a "sweet, modest, hard working girl". She said: "I'm devastated that we have lost such a talented young actress. "When I first met Laura on Grange Hill it was clear she had enormous potential."